Based on the same stains and principles as “Speedy-Diff Complete” method. Testing takes under 2 minutes with sufficient reagents for around 75 slides. 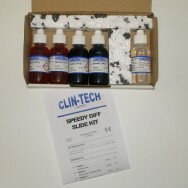 Especially useful in microbiology laboratories wishing to test CSF specimens, intestinal parasites etc.